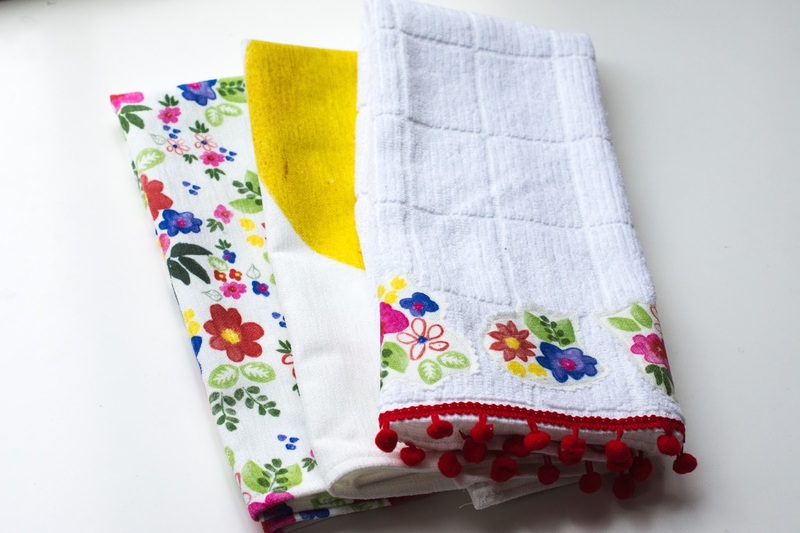 Snugglebug University: Lovely Chenille Kitchen Towels--EASY DIY! 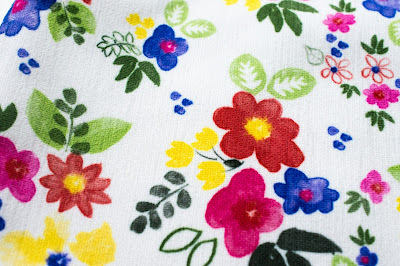 Lovely Chenille Kitchen Towels--EASY DIY! Happy Monday Friends! A few weeks I was struggling with what to get my mother for her birthday. Now I don't talk about my mom much here on the blog--it's my grandmother that taught me to sew--but in all honesty my mother probably influenced me just as much if not more when it comes to my desire to be creative. My mom is the artist. She's the one I grew up watching paint and draw. She's the one who filled our pantry closet with a slew of art supplies which we could get into whenever we wanted. She's the one who advised us on our school art projects and offered suggestions. Today she's still one of my biggest fans. 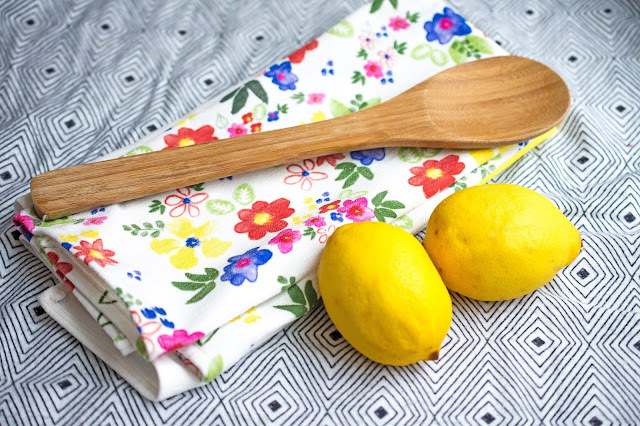 I'd decided that it might be fun to make her some dishtowels for her birthday when I got an email from Contrado, a company that will print your designs on a TON of different fabric types. I'd never heard of them before, but I was instantly intrigued because they had such a wide range of fabric choices (including oilcloth! felt! chenille! and velvet! SO MANY CHOICES!). They sent me a fabric sample swatch book, and I instantly fell in love with this water absorbent, heavy duty, thick chenille fabric. I knew that it would be perfect for some really lovely high quality kitchen towels. I created my design and Contrado sent me the fabric, and it was just as lovely and vibrant as I hoped. 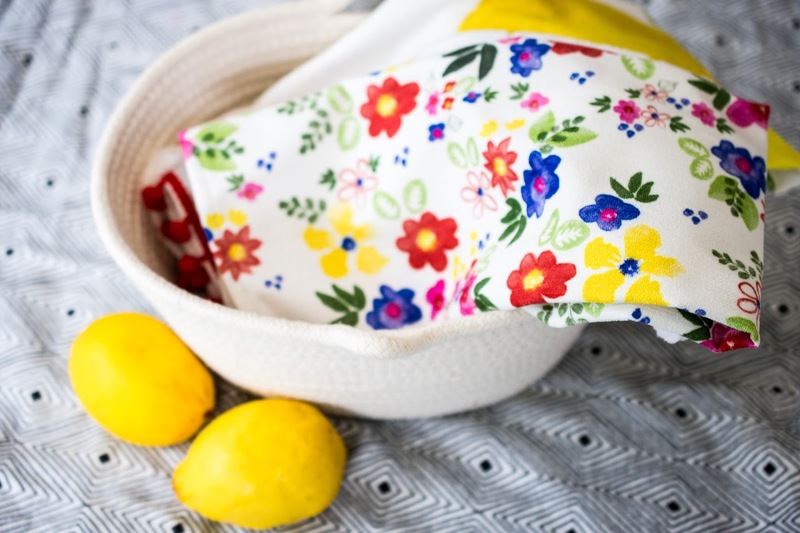 I loved it so much that I had to even take some of the fabric scraps and applique them onto a regular dishtowel. As you know, I'm a HUGE fan of printing on fabric. When I was a kid I used to take fabric and draw on my own designs with markers. So to have over a yard of fabric show up on my doorstep with my own designs on it is pretty much my childhood dream come true. Today I'm going to take you through the process of how I worked out a design for these towels, and how to make the towels themselves. 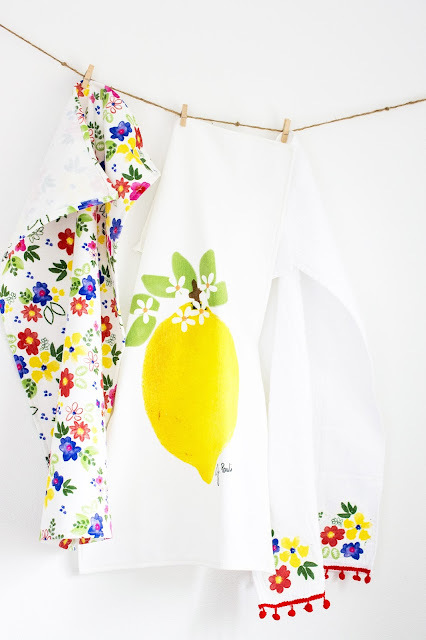 On demand fabric printing opens up so many lovely ideas for projects. You can made a tote bag with pictures from your latest travels, a bag with your child's artwork, or even old family photos. The options are seriously endless. Are you ready to see how these towels came together? 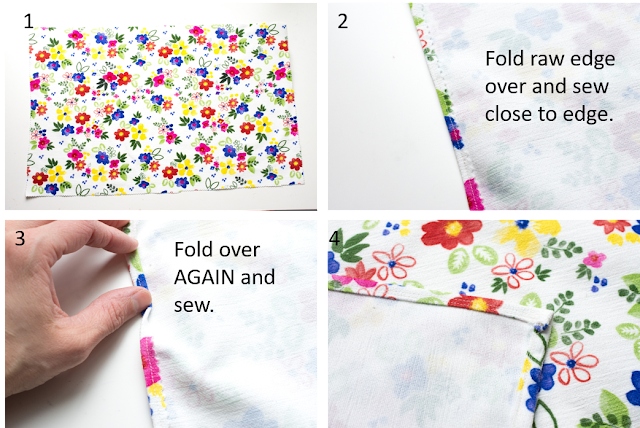 From design to sewing up the fabric? Let's get started! I had two major designs on my fabric. 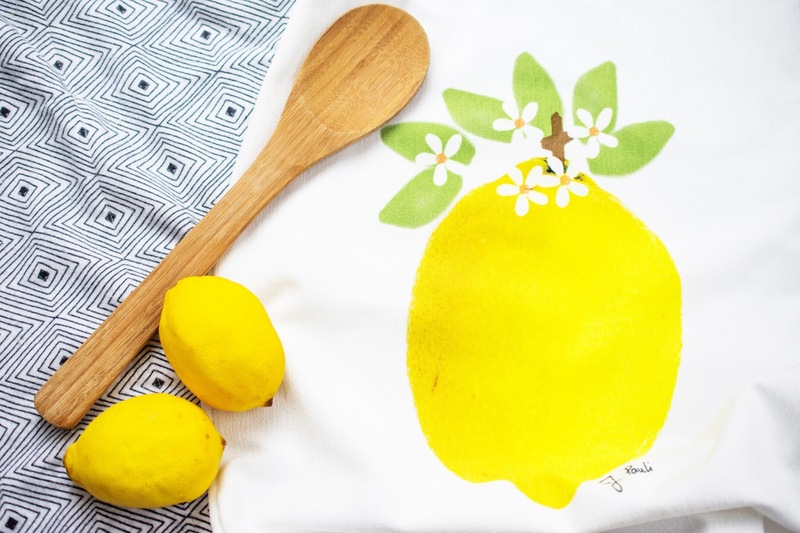 One was a floral design, while the other is a picture of lemon that I took (with some illustrations added to it). Contrado actually makes it very easy to add your designs on their website. You basically just create your images and drag and drop. But the truth is, the design looked absolutely NOTHING like that when I started. 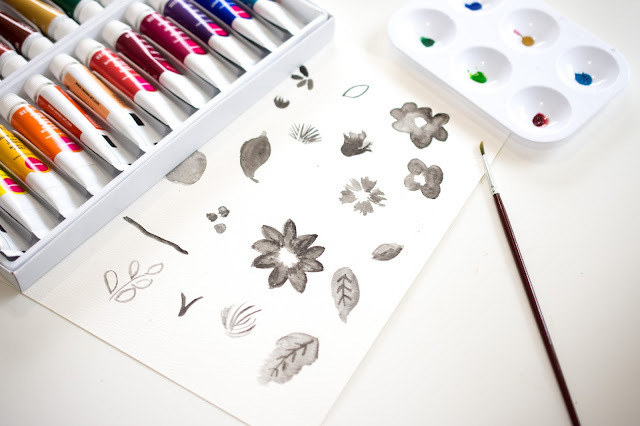 In fact, I found it easiest to watercolor my flowers separately, in black watercolors. Then I combined the flowers in photoshop to make the pattern that you see here. If you'd like more information on the photoshop part of this process, you can read more about it here. I formatted my design so that each towel would be about 16 x 25 inches, before I finished the edges. Sewing up the towels was actually the easiest part. I cut out the towel with pinking sheers, folded over the raw edges and sewed them together, and then folded that over again. The result is a very nice edge with no raw edges shown at all. Beautiful right? I'm so excited by these! I really love the chenille for the towels instead of a more lightweight fabric. I think they will make absolutely lovely hand towels! Have you ever printed on fabric? Have you ever heard about Contrado? I'd love to hear what you think! 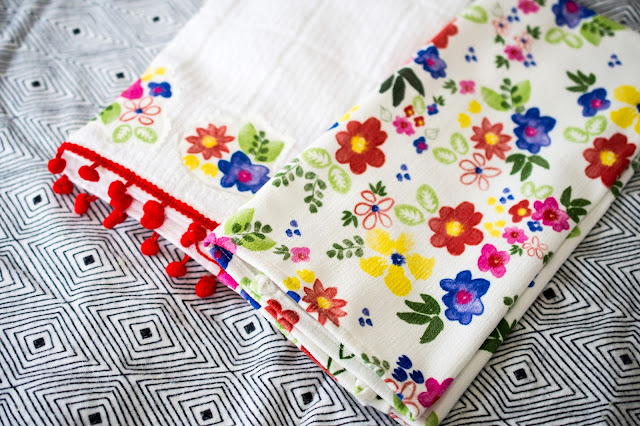 Georgeous patterns and lovely towels!! !